Check-in is between the hours of 3:00 pm and 8:00 pm. Check-out is at 11:00 am. to avoid charges of one night�s stay or 50%, for reservations of two nights or more. may require a 50% deposit or payment in full. Click on "reservations" below to reserve the rooms you would like. 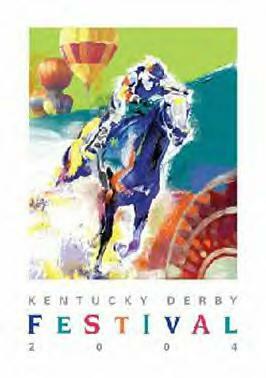 Special rates are now in effect for the Kentucky Derby, 2007 with A 3 night minimum stay. Derby rooms must be booked by phone, call tollfree: 1-866-637-4985.
are all subject to special rates and a minimum stay. Some other major events and conventions also require a minimum stay as well. The dining room walls at the Aleksander House are lined with French Toile paper and prints of French Impressionist painters. The beautiful Oak and Walnut hardwood floor is covered with a lovely oriental carpet in shades of dark and light blue and rose. The furniture, except for the Duncan Fyfe dining table, is Queen Anne. From two small round tables at one end of the room, guests may select freshly baked muffins, cookies and pastries to savor with steaming cups of gourmet coffee made from Aleksander House's own blend. Or, in the summertime, freshly made iced lemon-ade. Gourmet teas (hot and iced) are also available. Breakfast at the Aleksander House is a real treat. Served between 8:00 and 10:00 am, it may consist of Belgium Waffles with fresh strawberries and real whipped cream, Grand Marnier French Toast or Dutch Apple Pancakes smothered in slices of carmelized Granny Smith Apples. Or it might include one of their many egg dishes, such as Tomato-Onion Quiche, Croissants au Gratin or Eggs Benedict. The meal begins with fresh orange juice and a choice of cereals or granolas, yogurt and fresh fruit. It may include special fruit dishes, such as Pears Poached in White Zinfindel or Hot Ginger Peaches. 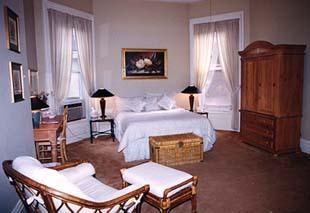 ALEKSANDER HOUSE is an intimate in-town bed and breakfast centrally located in historic "Old Louisville". The 1882 three-story brick building is completely restored and listed on the National Registry of Historical Landmarks. Nancy Hinchliff, the Innkeeper/owner of the Aleksander House, taught school in Chicago before moving to Louisville in 1995. After teaching in Chicago's inner-city highschools for twenty four years, she returned to the university to work on her PH.D. in Education where she taught Secondary School Teaching Methods and Curriculum and Instruction. Upon retirement, she moved to Louisville and bought a lovely 1882 Victorian home in "Old Louisville". The house was spacious and friendly and seemed well-suited to entertain over-night guests. And so the "idea" of creating a bed and breakfast was born. It took eight months to convert it. It was no simple task, having to deal with The Department of Inspections, Licenses, and Permits, The Health Department, The Fire Marshall, The Historical Presevation Society and the City and State Revenue Cabinets, to name a few. New locks, emergency lighting, parking facilities, door closures, etc had to be installed. And workers of all kinds came and went. Some dependable and honest. And some not so dependable and honest. But eventually a change took place and a romantic, gracious place of lodging named "The Aleksander House Bed and Breakfast" was created. "Aleksander" is the Innkeeper's grandson's name. And, in keeping with this personal selection, all of the rooms were named after family members. 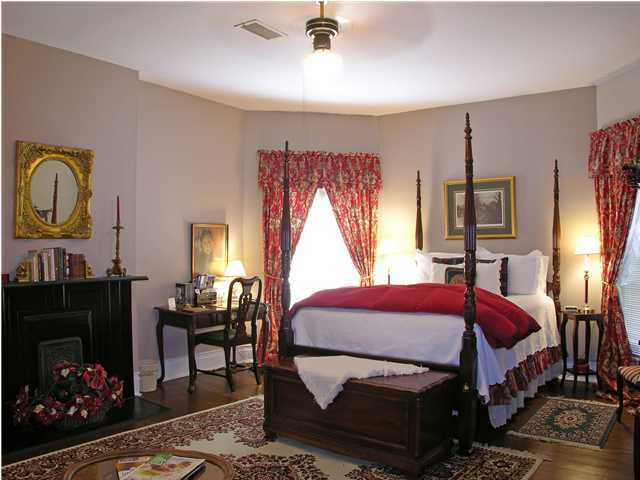 Guestrooms are tastefully decorated in eclectic or traditional furnishings with antiques, down comforters and oriental rugs. 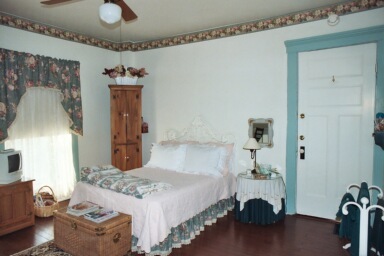 Rooms contain many amenities, such as telephones, TV/VCR/DVD players, CABLE, wireless, overhead fans, alarm clocks, refrigerators, terry cloth robes, fireplaces, shared and private baths. Coffee-makers, hair-dryers, irons and ironing boards are available upon request. 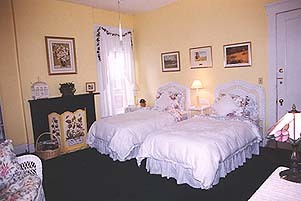 Kimberly's Room is a fully carpeted spacious room with double bed. A comfortable sofa and two large wing-backed chairs surround the lovely art deco fireplace and rose Moire draperies frame the four large windows. 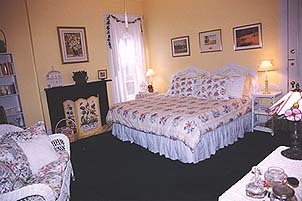 Amenities include a TV/VCR/DVD player, CABLE, wireless, overhead fan, telephone and terry cloth robes and refrigerator. A hair-dryer, coffee-maker, iron and ironing board are available upon request. The room is large enough to sleep four persons with a roll-away or can be made into a suite by including the adjoining room (penina's Room)and accommodate 4-6 persons. 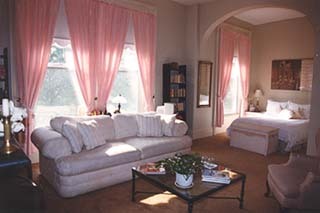 Roxanne's room is decorated with white wicker and Battenberg lace. Overlooking the garden in the back of the house, it is cozy, sunny and comfortable, with private bath, TV/VCR/Cable and wireless. It has a king or twin beds, refrigerator and overhead fan. Penina's Room is spacious and comfortable. 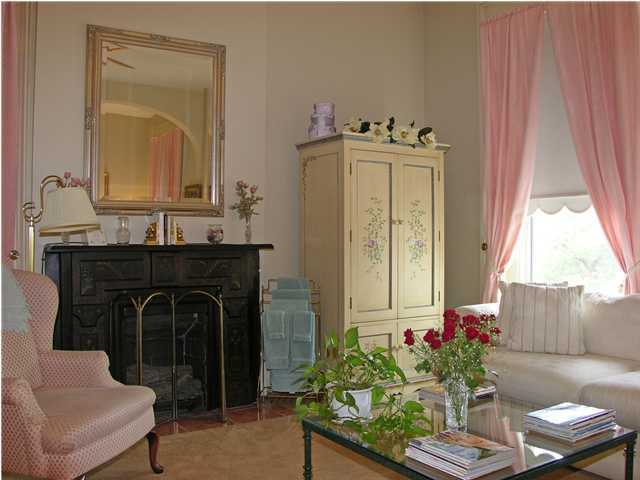 Fully carpeted, it is draped in ecru silk with queen bed, pine armoire and writing desk, overstuffed love seat and comfortable reading chair and ottoman. Amenities include TV/VCR/DVD players, CABLE, wireless, , iron & ironing board, telephone, alarm clock, overhead fan, refrigerator, terry cloth robes and private bath. This room may be combined with a connecting room to form a spacious suite large enough for 4-6 persons and is perfect for families with children. We have relocated our Video library, which used to be in the suite. Upon demand from our guests, who love the library (which is quite up to date), we moved it to the first floor reception area so that everyone can have access to it. To date, we have over 350 videos, which include all the academy award winners of 2006 & many others. We are now working on building up our DVD library. 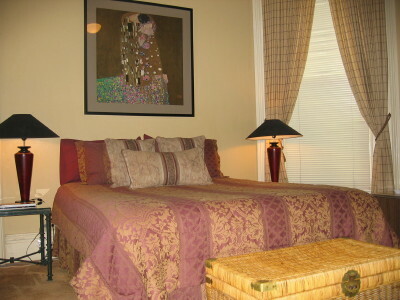 ..........are available in each of our guest rooms. Wireless is also available thoughout the entire Inn, as well as on the deck. 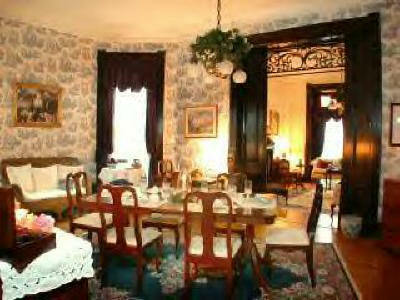 In 2002, the Aleksander House was asked to be on Old Louisville's Victorian Holiday House Tour during the Christmas holidays, a major event held annually. Six to eight houses are selected to open their doors to the public for a two-day week-end event the first week-end in December, so that residents of Louisville and visitors may have a peek inside at the beautiful Victorian houses dressed for the holidays. To take advantage of this occasion, Aleksander House decided to go ahead with a much needed update and redecorating project. 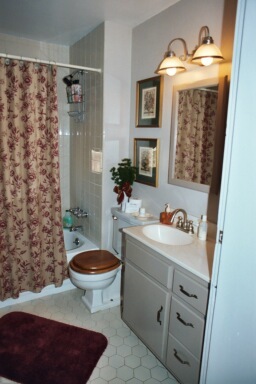 We painted, papered, added new fixtures and repaired. By December 1st, the house was in great condition, thanks to a $15,000 update. Below are pictures of some of the renovations with short descriptions of what was done. I have left the pictures of rooms "the way they were" so that comparisons can be made. Katharine's Room, which had been painted a stark white, is now a lovely, muted shade of Taupe. The ceiling was lightly tinted to match the walls. This color adds to the warmth of the room and contrasts beautifully with the stark white enameled woodwork (also newly painted). A few new decorative items, including a pair of Venetian wall sconces, were added and some of the mirrors and pictures were changed around. Linens and towels were updated. The bath for Katharine's Room is also done is a light Taupe to match, with new shower curtains, window curtains and tub mat in a beautiful shade of Burgundy, new fixtures at the sink, new lighting and new vinyl shutters at the window. See below. Amenities include TV/VCR/DVD player, CABLE, wireless, overhead fan, iron & ironing board, refrigerator, terry cloth robes and private bath. The walls, in Alek's Room, were painted in Ivory Linen and the trim around all of the doors and the windows was painted a beautiful, shiny greenish blue. We then added a border of flowers, matching the valances and dust ruffle, around the top of the walls. Next a new Matlasse coverlet in a matching shade of pink was added. The pictures were changed, more were added and a lovely mirror was placed over the fireplace. It has a charming country feel now. Amenities are the same as Katharine's Room. Penina's Room was also treated to major changes. The walls remained the same; all, except the north wall which was wall-papered to coordinate with the new comforter, shams and drapes. The color scheme is now cranberry, gold and beige. . 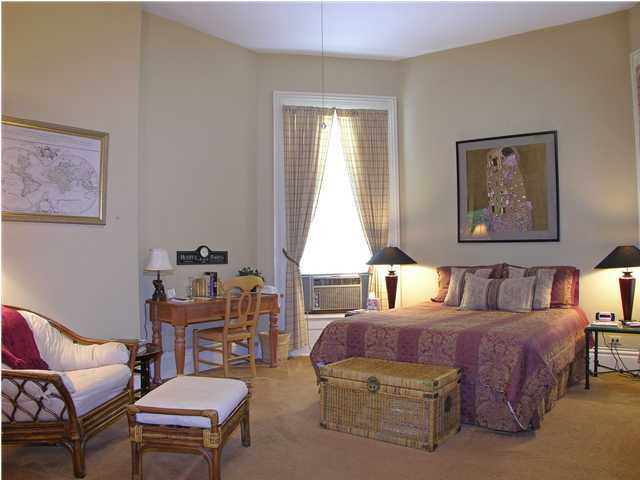 This room is spacious and comfortable, with overhead fan, individual AC and windows that open for fresh air. It also includes amenities such as: TV/VCR/DVD player, CABLE and wireless; as well as refrigerator, telephone, terry cloth robes and more. Business travelers will welcome the writing desk and internet access. The spaciousness of the room, small library, sofa and chair with ottoman all add to its relaxing and comfortable feeling. 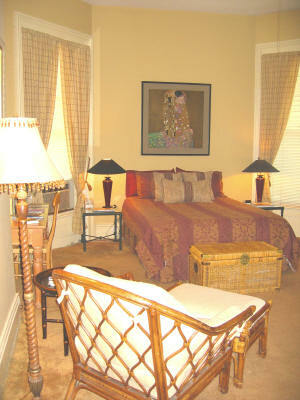 It is perfect for a few days stay and can accommodate more than two persons, with a roll-away added.